I’ve been using SkyDrive for a while but in a very casual way. My OneNote notebooks are there so I can access and sync them across multiple devices. My phone pictures are there from when I had a Windows Phone. Other than that, I haven’t used it for much. That changed big-time when I got my Surface, though. One of the big selling points of Surface was that it was a tablet with Office. In order for me to realize my dreams of never-ending productivity, I need the ability to share documents between my Surface and other computers easily and efficiently. 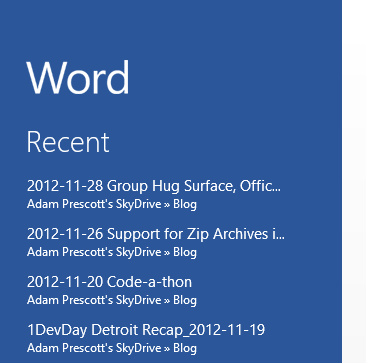 I knew that Office 2013 added integrated SkyDrive support, so this was the obvious sharing solution to me. I wasn’t expecting more than an online repository for my documents that I could access from multiple machines, but Office 2013 and SkyDrive provide a cross-machine experience that am absolutely delighted with. So what do I like so much about it? First of all, it’s easy to use. It’s the default save option, much like “My Documents” used to be. I don’t have to install any additional software or worry about services running to synchronize the contents of a folder. I don’t need to remember where a synched directory is, and I don’t have to do any browsing. I click “Save,” and I’m there. 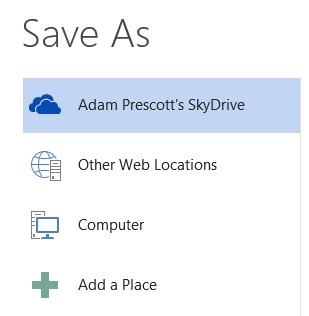 The next reason I’m sold on the Office + SkyDrive solution is that it’s seamless across computers. When I create a new document on my Surface and save it to SkyDrive, that document shows at the top of the recent documents list on my work laptop. How cool is that!? Without doing anything more than using Office and saving to SkyDrive, I can move from computer to computer and pick up exactly where I left off. The third reason that I’m sold on this solution is that, in addition to incredible machine-to-machine experience, you can also access your documents from the web. The Office web apps are very impressive; they look and feel just like their desktop counterparts. I know that there are ways to do all of what I’ve described using other solutions. I’ve been a fan of Google Docs for a long time, and it’s been my go-to resource for personal documents that I need to access from the web. At work, it’s a different story. I can’t get away from Office, and getting the features I’ve described above from other services requires effort and, often times, leads to a more complex process. 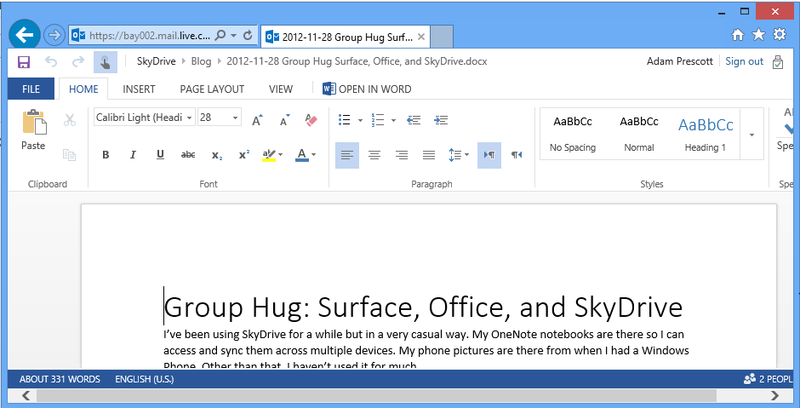 Office and SkyDrive give you all of this out-of-the-box with no effort. Now throw Surface into the mix, and it feels the holy trinity of mobile productivity.